Russian artist Elena Kovylina held a performance at Palace Square, St. Petersburg last week in preparation for her project which will be presented during MANIFESTA 10, the Biennial of Contemporary Art. The project Equality (Egalite) is a statement by the artist of a modern democratic society, which, in her opinion exists as a utopian idea of modernity, Kovylina believes this society differs by its duality in political, social and cultural spheres which do not allow for social inequality to be overcome. During MANIFESTA 10, a video of the performance will be shown in the General Staff building of the State Hermitage, as it was also presented in 2007 and 2009 in Paris and Moscow respectively. Elena Kovylina uses a range of media including video, film, installation, and performance. Her first performances took place in the late 1990s, when she was testing the strength of her body—as well as the emotions of her audience. Kovylina does not shy away from confrontation. Indeed, many of her actions emphasize social critique in harsh or satirical ways. Her targets are conceptions of identity and Russia’s political and social structures. Kovylina studied at the Surikov Art Institute in Moscow (1993–95), the F+F School for Art and Media Design in Zurich (1996–98), and the Universität der Künste Berlin, where she studied with Rebecca Horn (2001–03). 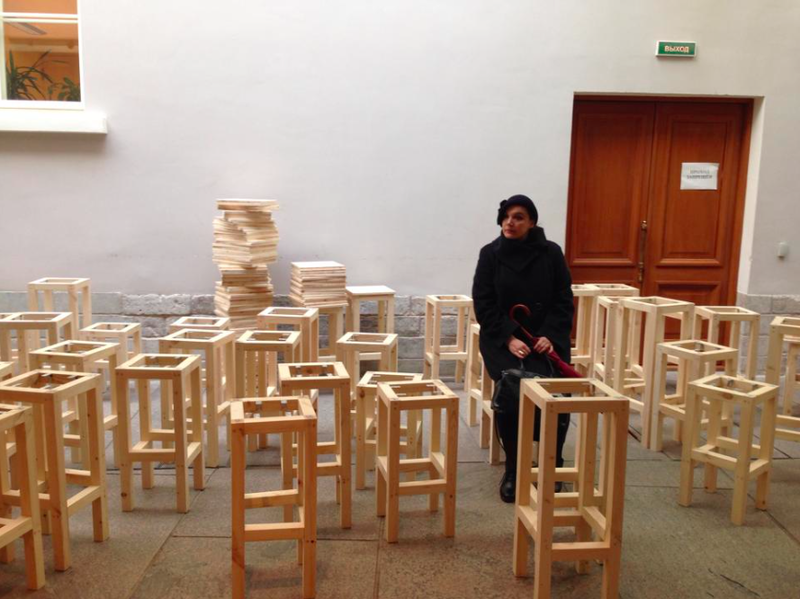 Her work has been shown in international exhibitions and screenings, including such venues as the Miami Dade College Museum of Art and Design, Miami (2010), Tirana Art Biennial, Albania (2009), Sharjah Biennial in the United Arab Emirates (2009), Lulea Art Biennale, Sweden (2009), Moscow Biennial (2013, 2009, 2007), FAFA gallery at the Finnish Academy of Fine Arts in Helsinki (2008), the Akademie der Künste, Berlin (2008), Sydney Biennial (2006), and Prague Biennial (2005). ← LES PÉRIPHÉRIQUES COMME DES HALOS DE LIBERTÉ ou GUSTAVE COURBET EST INNOCENT !